Vogue Italia scores more points with featuring yet another spread with amazing black models in their February Issue, "Miss Josephine Baker", paying homage to entertainer and icon. 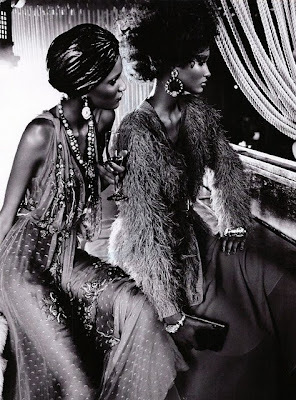 The Black Allure, wonderfully directed by none other than Franca Sozzani, director of Vogue Italia, is nothing short of controversial, but tastefully done. 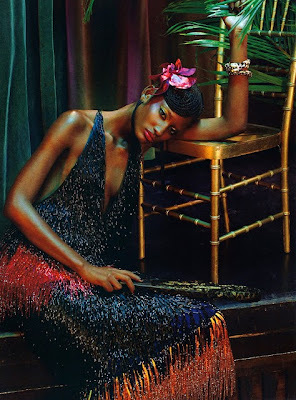 The model's featured are my most of my current favourite black models,Chanel Iman, Joan Smalls,Jourdan Dunn,Lais Ribeiro, Ajak Deng, Arlenis Sosa Peña, Chanel Iman, Georgie Baddiel, Melodie Monrose, Mia Aminata Niaria, Rose Cordero and Sessilee Lopez. The shoot was IMPECCABLY done and simply GORGEOUS. From a range of black and white to beautiful vividly coloured pieces from Prada's latest collection, The Black Allure is nothing short of Eye Candy for the fashion industry, as well for anyone simply looking at these beauties! While channeling 1930's icon, Josephine Baker, styled by Edward Enninful, featuring stunning gowns, chunky accessories, these glamorous ladies make this issue larger than life. Enjoy!